Don’t judge a book by its cover they say – and the same goes for people and homes. Rukshan Perera, despite an intimidating list of talents and achievements, is down-to-earth, unassuming and always smiling. The high walls and narrow entrance to his home too are imposing, but a deceptive cover to a cheery and comfortable interior, noticeable parts of which are an organ, electric guitar, and stacks of concert flyers. De Lanerolle Brothers. The extravagant line-up of guest artists is testimony not only to Rukshan’s genius but also the importance of the Colours of Courage Trust in aid of which the concert is being held. theme of ‘You Are Strong’. The list of Rukshan’s songs that deal with serious issues is surprisingly longer than for most other artists, and he believes he has been more outward looking than most from a young age, though he “never thought of that”. 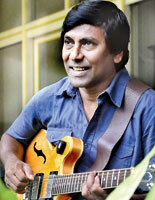 And he doesn’t seem to think much, either, of having formed his own family band at the age of ten (wittily called the Kalaa Maediriyas – a pun on the Sinhala word for “art”), of having been playing for the Golden Chimes from the age of 14, or of having toured Asia and Europe in his early twenties – all feats the kind of which only a handful of us can lay claim to. What he does think of though, is the state and status of music in our country: “The problem is the time and the money”. He shares regretfully how Sri Lankan musicians trained abroad are reluctant to settle in their homeland because “the situation is just too bad” for musicians and artists. It’s “just not right” he declares, how performers he has known over the years (in a musical career spanning nearly half a century mind you!) are still earning what they did a decade or two ago. But just as his music and lyrics are hopeful, Rukshan’s outlook is also very positive. “It’s really encouraging” he shares enthusiastically, that musical atmospheres such as that provided by Music Matters are being created by a generation of young and very talented artist, who choose Sri Lanka over so many more lucrative options, in order to simply encourage true musicianship. Which is why Jazz Unlimited, the monthly jam session at CR&FC, is another source of encouragement for Rukshan, who is enthusiastic that a younger audience listens to more challenging music and “not just pop or whatever that sells”. He is excited about the space these and similar gatherings create for an audience to be required to be informed about and understand what they’re hearing. “Just the fact that they come there to listen to it is amazing” he shares animatedly, his eyes glittering, “because if you don’t start somewhere, you’ll never do anything”. This comes from a man who has been pretty much everywhere and done pretty much everything, musically. “I try to think out of the box” he shares thoughtfully, “I do a lot of experimental stuff”. He talks of making up his own exercises when he was a teenager, demonstrating them and then laughing mischievously. His unassuming nature makes it impossible it seems, for him to make much of his amazing talents, and its mostly like a child sharing secrets or pulling pranks that he talks (chuckling intermittently with a glint in his eye) of what he plans for the concert. He sings (and sings effortlessly, a single short line of music enough to assert the fluidity of his mellow voice), plays the guitar and keyboards, composes, arranges, scats (a form of complex vocal improvisation traditional to jazz and not unlike the north-indian alap), scats with the guitar and scats harmony to the guitar! And if this sounds like an amazing list of talents – wait ‘til he begins to whistle. If you don’t know what this means, that’s a sure sign you need to be at his concert. Get your tickets from Park Street Mews, Commons, Torana or Video International (Nawala), and prepare to be astonished.